I am SO EXCITED! I never dreamed how EASY it would be to make paper mache look as though it is RUSTED! Sure, I've painted surfaces to get a similar look, but this is AMAZING to me how simple it is and how much it really does look rusted in real life. I will apologize right up front for the poor quality photos. I was so excited to try this that I got out of bed and went directly to painting without even turning on the lights! Last night, as I was attempting to go to sleep, I had this idea, so I watched the DecoArt video by Andy Skinner, again, and decided what I would use and I just started painting. 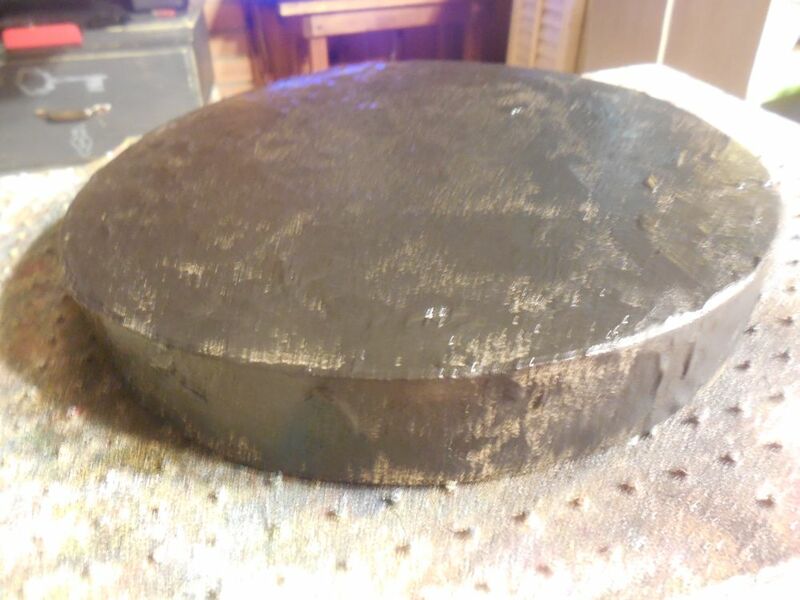 With the use of my hairdryer, I had this process finished in about 30 minutes! 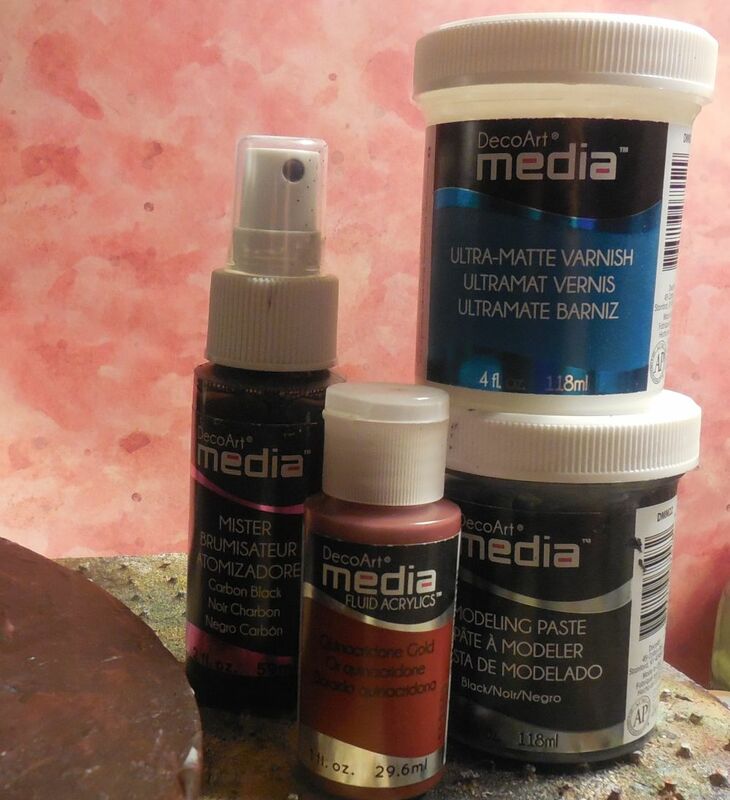 I used the 4 products listed above: Quinacridone Gold, Carbon Mister, Black Modeling Paste and Ultra Matte Varnish. These products are in the new line of DecoArt Media...The fluid acrylics are strongly pigmented, so they take very little paint. They are transparent, which gives them versatility. They are SO MUCH fun to play with! IF you are one of THOSE PEOPLE who think they have no use for these products, PLEASE go watch some videos and you might be surprised at what they can do to help you stretch those creative juices! I will admit, I had NO CLUE what they were when they were introduced, but now, I have most all of the products and I plan to get MORE! I would suggest buying the starter kit to begin your journey. 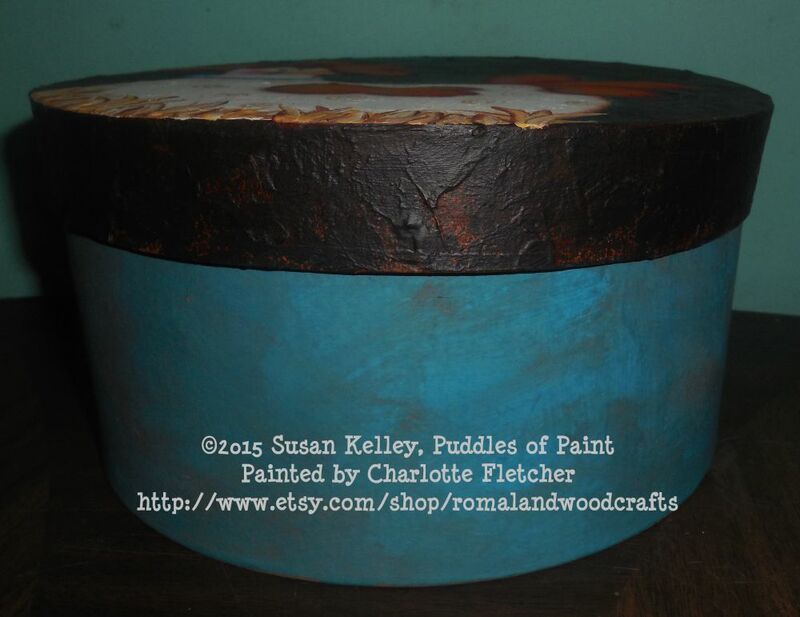 Go to DecoArt (click on the blue) to see what they offer. While you are there, CHECK OUT the hundreds of FREE PATTERNS that are available to you...I think you will be quite pleased with the variety. I didn't have the exact products that were used in the video, so I did my own thing...I sure had nothing to lose. I took the BLACK MODELING PASTE and spread it on the paper mache box randomly....I did this with my finger. 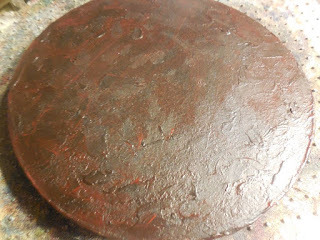 If you don't have black, then use white or even use gesso...The goal is to get some texture. 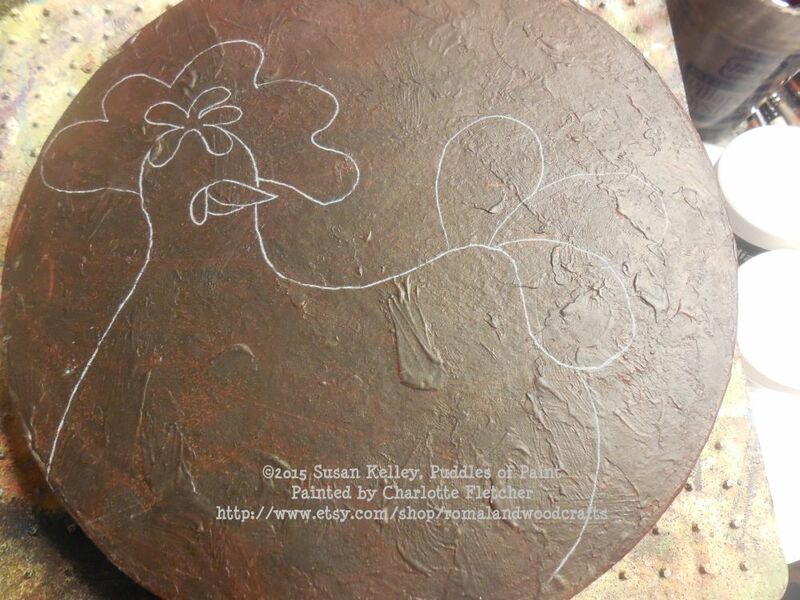 You get texture simply by stamping, so see what you have and use what you've got! I covered them with Ultra Matte Varnish. Look at this picture...isn't that the COOLEST THING? 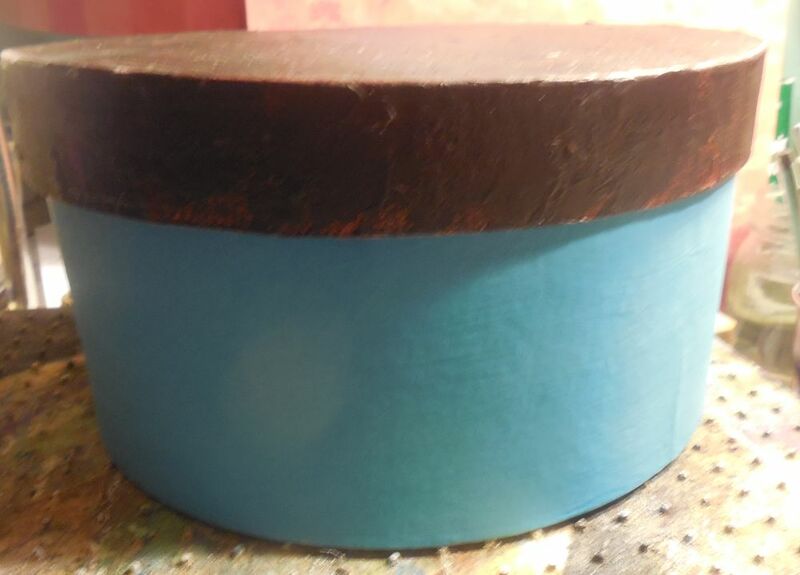 but this Paint is making me VERY HAPPY. What would I do differently? 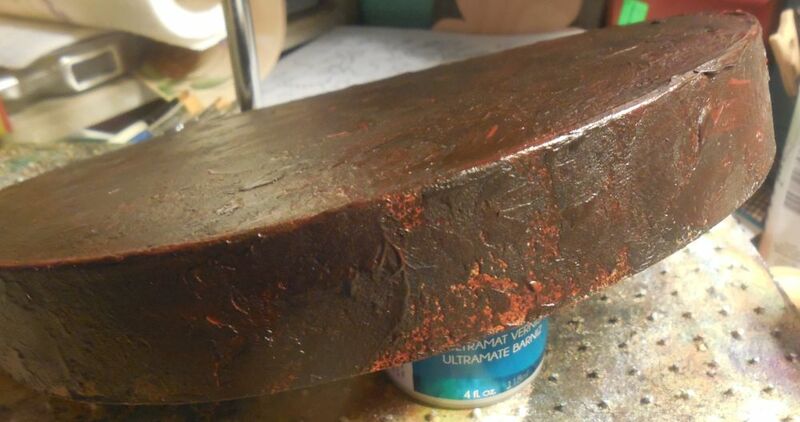 I would leave more of the paper mache showing because see that light brown in the pictures...it looks AMAZING!! That light color is where I left the paper mache uncovered with paste or paint BEFORE I painted it with the QG! I used DecoArt Chalky Finish TREASURE to paint the bottom of the box. I sanded it to give it a worn look to match the rust. I wanted to show how nicely you can transfer your pattern on top of the Ultra Matte Varnish. 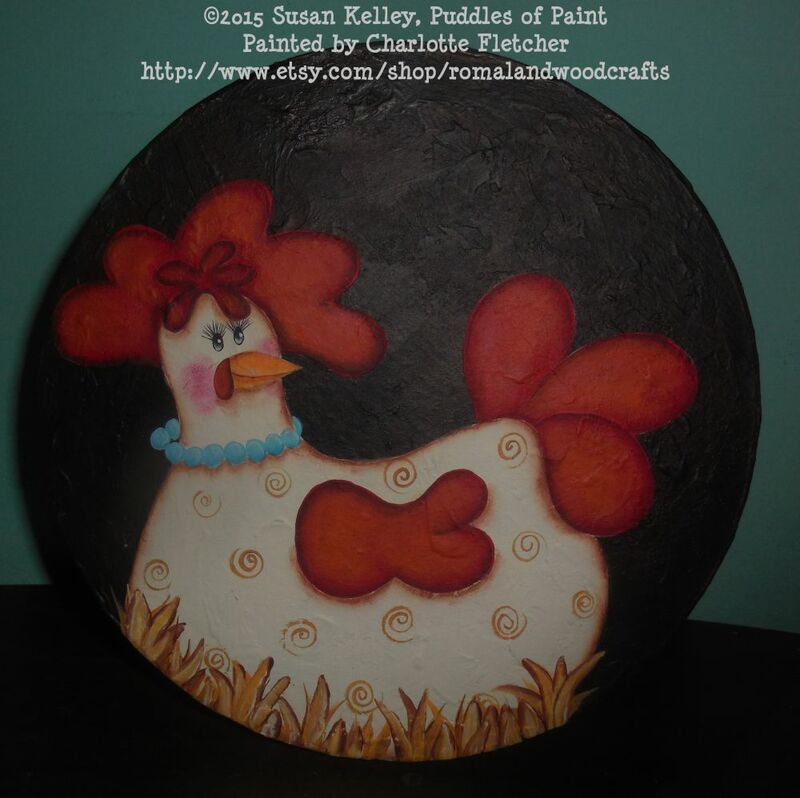 This painting, called CLASSY CHICK, is dedicated to ALL of my CLASSY CHICKS...you KNOW who you are Susan, Kathy, Lynn, Ramona, Nancy, 3 Lisa's, Michele, Suzie Q, Wendy, Mindy, Sheila, Kat, Diane, Lois, Jan, Karalee, Anne, Gloria, Judy, Margaret and WELL, I'm going to stop naming names because there are DOZENS of YOU....REALLY...LOTS of YOU and I wouldn't trade YOUR friendship for all the riches of the world, because YOU make my world RICH! 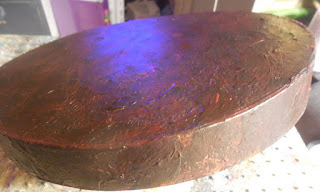 I put English Red Oxide Antiquing Creme on the bottom of the box to carry out the aged look...I really do LIKE this! I HOPE you will give this technique a TRY.. ALWAYS embrace new opportunities...new products...new ideas...CHANGE can be your friend! Don't be afraid and by all means, don't feed the old demon of I'VE NEVER DONE IT THAT WAY BEFORE AND I DON'T WANT TO CHANGE...you are robbing your creativity of endless possibilities! Hi Charlotte! This is truly amazing stuff! So simple, yet so wonderful and authentic looking. Mr. Skinner is such an inspiration! 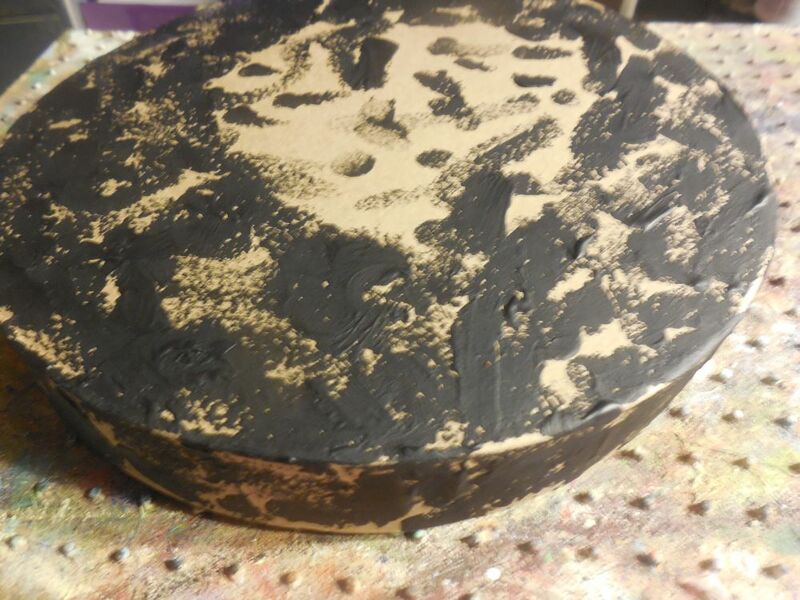 I watched his videos this weekend and I was so scared that I wouldn't be able to make this technique work and it WAS so EASY and COOL looking!